Much like Will did on Saturday, I also went up to look at the Silver Lake Reservoir Meadow. Just a couple weeks ago, the fiance and I were musing on why the hell it was closed to the public. We blamed the DWP. We couldn’t figure out why else that gorgeous piece of lawn would be closed. We got there at 10:30 (we’re sluggish at best on Saturdays) and found the meadow was just hopping. There were dozens of families, all with children in a similar age bracket (from barely self-ambulating to about six or seven). There was the town meeting tent, with a line of fifteen people or so, arguing their points to a grave looking Eric Garcetti. And there was the Observatory Orchestra soundtracking the event with their brass quartet. I stopped to listen to the town meeting for a few minutes, because I couldn’t imagine what the arguments could be to NOT open the meadow. Obviously, there’s a degree of NIMBYism in every neighborhood – and I did hear one particularly offensive argument along those lines – but surely, in Silverlake, that wouldn’t be enough to keep the park closed, right? Not like it would be in some of the Westside communities. It was with a lot of shock that I realized people were arguing to keep the meadow closed to protect the wildlife. I could kind of understand traffic concerns on weekends, or parking shortages. I could definitely understand concern that the park would be ill-maintained. But NONE of the arguments, even when added up, seemed to be enough to counterbalance the sheer joy that people were having on that lawn. Everyone was so happy – especially the dozens of munchkins running around – that I couldn’t understand how the opposition had enough weight to keep the meadow closed. Here’s the thing: I’m radically biased. I grew up in a community not unlike Silverlake – an older, residential area – with a LOT of green space. I spent years in Vancouver, which I believe has one of the highest proportions of green space to residents of any city in North America. Los Angeles, conversely, has the lowest – and it was a major culture shock to come here and just not see parks. I’m in favor of public green space, no matter what. I believe it has such positive psychological effects that it can make a city a much better place. I’m happy every time I go past MacArthur and Lafayette parks (during the daytime) and see families picnicking, or playing soccer, or just enjoying their day. And not only does public green space give everyone a place to spend that kind of quality time with their family and friends, but it also serves as a community meeting place – somewhere for people to interact with their neighbors. I have always loved having as much green space as I did in BC, whether it was as a smaller child playing catch, or an adult playing Ultimate. And I think everyone deserves that. As for the opposing arguments, I can understand how some of the reservoir neighborhood residents are concerned about traffic, or parking, or noise. Especially on weekends. That’s a big load to pour into an area that doesn’t have many other open green spaces. Elysian Park is the nearest lawn-style green space – and it’s almost three miles away. And with the existing traffic and safety issues on Silver Lake Boulevard, it does seem like more urban planning would be necessary to open the meadow on a long-term basis. What I can’t get is the argument to keep the meadow closed for the coyotes and other animals living on it. Are you people serious? They’re coyotes! They’re already ecologically screwed! They’re in the area because they’re either a) directly dependent on human garbage or pets or b) eating other animals that are more numerous because of human occupation. The coyotes themselves are there because they have no predators! Their ecosystem has already been destroyed, and they’re about as natural as any other urban wildlife. I would rank the coyotes right up there with a plague of bunny rabbits descended from someone’s pets, or an infestation of raccoons who are multiplying from lack of predators and surplus of garbage, or a flock of mallard ducks who are fat and numerous from birdseed handouts. Have the coyotes been there since before the houses were built in Silverlake? Are they a hold-out from before urbanization? Is their life the same as it was before the city took over the area? I’m not a biologist, or a zoologist, but I do not think it’s a valid argument to argue to keep the meadow closed. And I also shuddered at two of the NIMBY arguments. First of all, it was suggested that as soon as the reservoir opened, there would be condos opening in the neighborhood. Never mind that zoning is completely separate from parks – it would just open the floodgates for condos. And it might even encourage the Parks department to “Disneyland up the park a little.” I seriously doubt that there’s going to be enough traffic, even on weekends, to justify any Disneylandification, but mostly, I didn’t agree with the arguments that the opening of the meadow could lead to more evils. More horrifying though, was the argument that one man made, pointing out that we should all check out the other parks in the area before opening the meadow, because that was who was going to be using them. I was thinking to myself, “PLEASE don’t say that you don’t want the “element” in your neighborhood,” when, sure enough, he insinuated that good old NIMBY argument about poor people using parks. “If you want people playing ghetto blasters here, and if you want to have to put rocks on the lawn to keep people from playing soccer in the park, be my guest.” he said. One man yelled “Shame on you!” and I saw some others in the crowd visibly cringing. Seriously, doesn’t that argument kind of belong back in 1965 or so, back when it was used to strike down public transit in fear that black Angelinos would have an easy way to come up and rob white Angelinos? That was the only offensively extreme NIMBY argument I heard. On the way out, we ran into Cybele and her man, and chatted for a few minutes. And then we headed up for our Saturday run to Trader Joe’s – and the rest of the weekend. Which was pretty jampacked. Anyways, check out my Flickr set for more meadow – including a lot of photos of people having a really wonderful Saturday. Like I said, I didn’t hear a good reason to NOT open the meadow, not after I saw the kind of joy people had there. Many years ago there was a story in the LA Times about how some people were angry at the way Latinos were using the Angeles Forest, bringing in food, radios, and other things for a fun weekend. The nimbys had the idea that forests were to be used in only one way, to be a place for quiet hiking and contemplation. Though there was no proof that having fun in nature was having a negative effect on the environment, the locals just didn’t like the way the space was being used. I imagine there’s some of that going around. Yeah. What that park really needs is more screamin’ brats ignored by their parents, pinatas and bouncy houses! That’s what I call goooooooooooood fun! I’m totally in favor of the meadow opening, but I’d just like to point out that your reference to Elysian Park being the nearest wide open space isn’t entirely right. Certainly it’s one of the larger, but when you look around in that three mile radius there’s actually a good number of so-called “lawn-style” parks: Riverside Park at Riverside and Los Feliz, Griffith, Bellevue, and on smaller scales Echo Park Lake, the Silver Lake park and rec center at the south end of the reservoir. And now maybe a mile or so beyond that circumference we have the Rio de Los Angeles Park and slightly further the Los Angeles State Historical Park. On the contrary about coyotes being “ecologically screwed.” These creatures have proven over the past few hundreds of years that despite man’s best efforts to exterminate them as a species they never fail to adapt and succeed. Should the meadow be opened as I hope it is, the coyotes will modify to any changes that may bring, either by laying lower during the day or foraging/hunting elsewhere. i attended the event and i thought it was interesting that most of the concerns revolved around the wildlife. so… why is no one mentioning the fact that every few weeks (or months sometimes) there is a huge film crew there. not only stomping through the grounds with a large number of people, but parking tons of vehicles right on the meadow! many people also had parking concerns, but when we got there around 10 there were still about 30 easy to find spaces. and that was with an unusual amount of people there since it was an event. As one of the organizers of Saturday’s event, I’d like to say that we are overjoyed at the turnout. Seeing all of the little munchkins playing at a distance as I stood and listened to people trying to come up with valid reasons to go against the greater majority of Silver Lakers made me concerned that there is still much work to do. I thank everyone who showed up and took advantage of the day. The Meadow is a big beautiful space, with water views that will some day become a great area for relaxation, play, and environment awareness education. 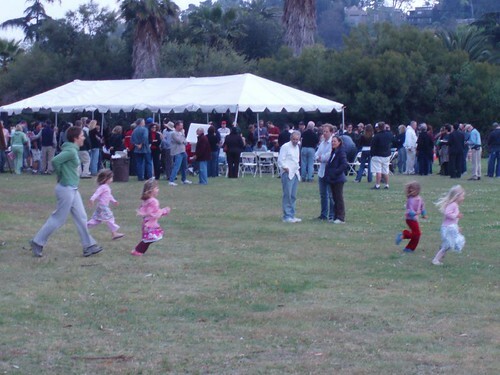 Today we have about 0.35 acres of park in Silver Lake per 1,000 residents; compared to the national standard of 6.25 acres per 1,000 residents; or to the City of LA: 4.2 acres of park per 1,000 residents. (Bellevue, La Sorda, Laurel & Hardy, Silver Lake Rec Center, Triangle Parks total 13.85 acres). That means that Silver Lake has less than 6% of the national standard! There is still work to do. We have to get the DOT to give the same attention to the neighborhood children that they give to the cars speeding down Silver Lake Blvd. At this point, they flatly refuse put in any kind of safe, pedestrian controlled crosswalk. and signing up to receive notification of future events involving the Meadow. Thanks again to everyone who supports this movement to make L.A. a more liveable city.